I found that all classes were extremely focused to get good results in the exam. They provided basic tips and techniques which could be used on all the subjects to get good results. The experienced teachers pointed out common pitfalls that might occur during exam. They faculty were easily approachable to help us clarify the difficulties and understand any concept. Highest No. of Selections in Rajasthan. Regular studies pattern and experienced guidance prepared me for performing best. I was regular in my MCC classes, I regularly revised topics explained in MCC’s class on daily basis and takes guidance from my MCC teachers to understand them better. Mr Manoj, director of MCC always motivates me to perform best. He gives me proper guidance to perform better in CA CPT Exams. Regular mock tests and mcc syllabus guidelines guided me to do smart work. A perfectly motivating environment encouraged me.I also want to thanks to my parents and brother for their unconditional support and love. Without their support this achievement was impossible. MCC is the Best CA IPCC Coaching in Jaipur. Teachers were so helpful to me whenever there was anything I needed or doesn’t understand they were always there without delay. The facilities were just amazing and place were homely. The best part of MCC was it’s mock test series which helped me to gain lot of confidence and this confidence helped me to crack main exam. Don’t believe in what we say? We appreciate your wisdom! Allow us to prove why we are the best CA Coaching Institute in India. 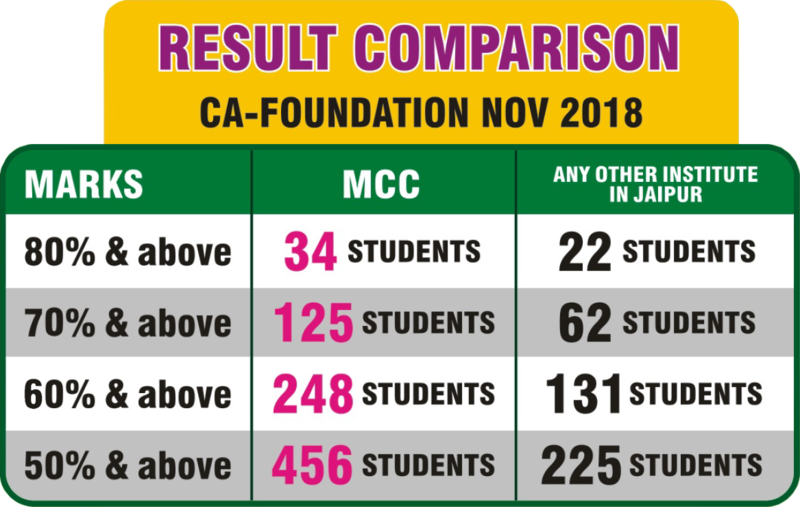 In 2018 MCC was the top CA Coaching Institute of Rajasthan giving the maximum 53 ALL India ranks for Foundation, Intermediate and Final level. MCC is the only Institute of Rajasthan to secure 41 AIR in Intermediate/IPCC in last 7 years. In 2015 & 2016, the students from Jaipur who secured All India Ranks in Finals were from MCC Only. We are proud of Our prodigy “ the 19 years old youngest CA achiever ”, Ankit Agarwal.